South India is world famous for its rich culture and heritage. The South Indian weddings are full of vibrant colours, floral decorations and lots of gold! Their alluring brides will leave you in an awe! It was a tough choice, but we’ve narrowed down 10 breathtakingly beautiful South Indian brides for you. This beautiful bride has kept it simple with a golden and white saree paired it with emerald jewellery. Simply elegant! This bride is breaking stereotypes by wearing a firozi blue coloured Kanjeevaram. We love it! The orange and red saree is impeccable. Her radiant smile makes her even more beautiful! A red kanjeevaram with a gold kamarband and minimal make up sounds just perfect! 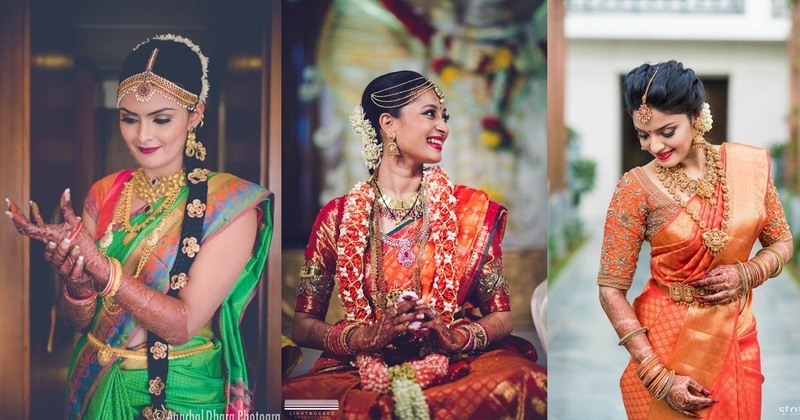 We love this bride’s ivory lehenga and how she has paired it with some non-traditional jewellery. Just like you, we are still staring at this bride! This bride has us mesmerized with her side portrait! This bride is giving tough competition to everyone out there! The plain background is lifting the vibrant pink of her saree. Alos, look at that kamarband!! This bride is totally rocking her bright yellow kanjeevaram! These mesmerizing brides in kanjeevaram sarees and exorbitant gold ornaments make us want to have a South Indian wedding too!